QuikDiSC® is an entertaining card game that introduces learners to DiSC® and increases training effectiveness. 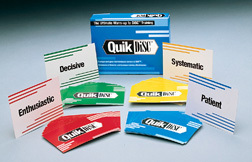 QuikDiSC includes 128 cards divided into four color-coded groups, each with 32 cards. Each group has four sets of eight words that describe D, i, S, or C behavioral dimensions. Complete instructions and ideas for small and large group games are included. Call 978-208-7333 for more information, price list, shipping, taxes, terms, or to place an order. “DiSC”, “Everything DiSC”, and “QuikDiSC” are registered trademarks of John Wiley & Sons, Inc. Enter your email address to follow Trish Pratt's blog and receive notifications of new posts by email.